What is pantomime if not for children? This review is drawn from conversations with two Year One classes from St Michael in the Hamlet Primary School Liverpool. The children had been on a school trip to the Unity Theatre to see an afternoon performance of the Princess and the Pea. The children found that the intimate atmosphere of this little theatre made it seem ‘old – like a house’ and they liked the seats that ‘went up and down’. Their teachers, Miss Tsai and Miss Powell, had worked with them in the morning to start them thinking about their favourite characters, and some of their drawings and writing are shown here. The teachers too were delighted with the show and said that evidence of the children’s absorption from the start was that throughout the performance, only one child from a group of some 150 had asked to go the toilet. This was not a scary pantomime. Although the big lights had gone down and the forest was dark, there were lights on the forest floor. The scariest characters were the Queen of Mean and the Wolf. The children were enthusiastic about the Queen’s magic mirror and they were completely accepting of this being borrowed from the tale of Snow White to show she is the nastiest in the land. Some children acted out the Queen talking to the mirror and the familiarity seemed to reinforce her role as a ‘baddy’. (‘She is really crool!’) The Queen’s pointy hat or horns, and all her yellow smoke emphatically signaled her to be evil and magically powerful. She was the one who ‘did a test to find out if the princess was really a princess’. The Wolf, who was ‘the most scary’, delighted the children. He had wanted to eat the Prince in the forest. The Prince seems to have been a bit of a wimp, and the girls in particular were thrilled that the Princess had rescued the Prince by ‘poking the wolf in the eye with a stick’. Several boys demonstrated how the wolf had howled ‘Ow! Owl Ow!’. 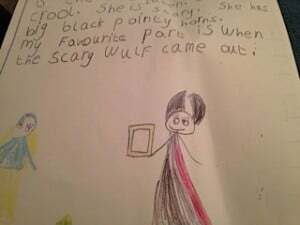 One little girl had clearly understood the nature of acting and she explained that ’the wolf only pretended to cry’. The pea seems to have stolen the show with his dancing and jokes. The children loved him because ‘he jumped up and down and was funny and noisy’. 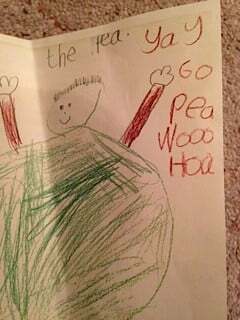 The pea had gone around the audience and the children had felt his costume. They described him as as ‘fat, plump and fluffy’. When he was under the mattresses he ‘wanted to get out’. They relished his joke about not wanting to be squashed or to ‘be a mushy pea”. It seems that these little ones had experienced this pantomime as pure theatre. Neither class was very impressed by the audience participation. The teachers explained that they been invited to see which side of the audience could sing the loudest. These five year olds were so involved with the story that this traditional part of pantomime seems to have been irrelevant to them. Some of the jokes had gone over their heads and one little lad had told his teacher that he had enjoyed it because all the grown-ups had laughed, and the teachers had indeed found it funny. The story had clearly been centre stage for the children. What a terrific incentive for the children to return to school after the excitement of Christmas and what a real educational experience for many of them! I asked both groups of children which they liked best: television shows or theatre? One or two children committed to the digital age said they preferred HD TV, but the overwhelming majority voted for the theatre. When asked why, an answer came back: ‘Because it’s real’. The above performance was attended by Year 1 class teacher at St Michael in the Hamlet Primary School, Liverpool on 6 January 2016. Set design: Victoria Saville and Molly Lacey Davies.